We report a possible basis of differentiation, based on the biophysical properties of fibers isolated from a Morgellons patient, as well as a future avenue of study for isolating the cause of Morgellons. Fibers, upon inspection, were found to be fluorescent. 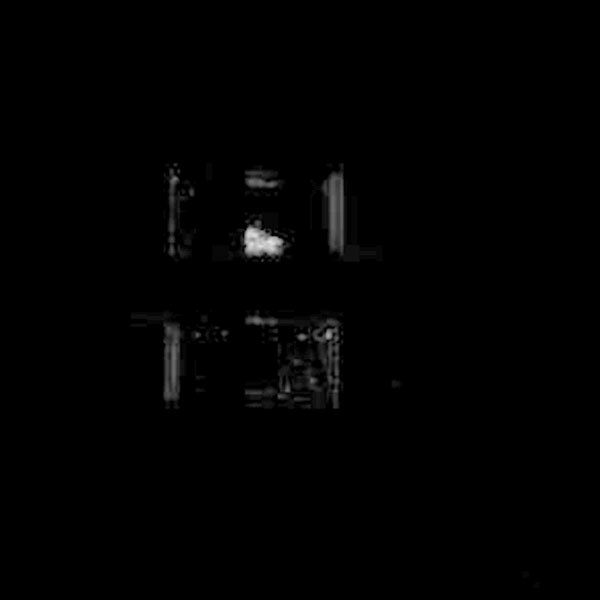 The pictures (Figure 1A, 1B) show both a fiber and a hair sample from the same patient observed under white light and a Hofstead filter (with 365 excitiation). The fibers were visualized in scintillation vials with a Innotech detector, showing fluorescence with both a Hofstead filter (460 nm)and a green fluorescent filter (SYBR Green, 557 nm) upon excitation at both 305 and 365 nm. The fluorescence ceased after the illumination was extinquished. A single fiber is shown in Figure 1C. 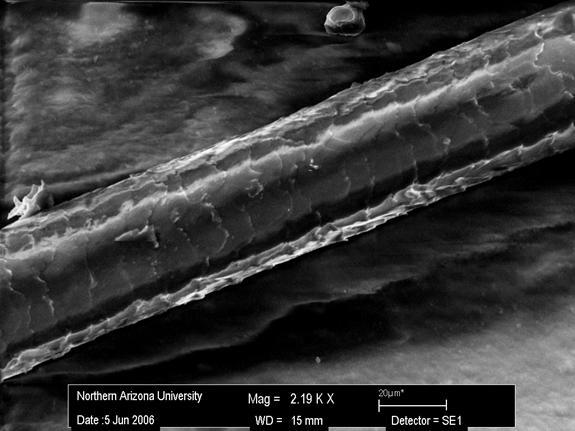 The fiber shown in 1C was examined via SEM Microscopy at the University of Northern Arizona, with no additional modifications or treatments. 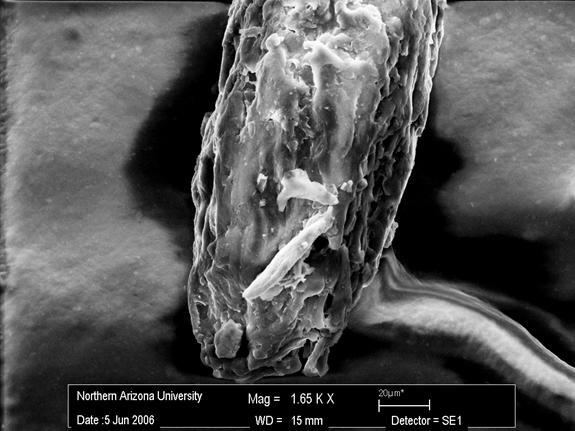 SEM analysis demonstrated that the fiber appeared to be a normal hair follicle with scales (Figure 2A) and a typical root terminus (Figure 2B). The absence of a smooth surface denotes that the fiber does not seem to be coated with a protein monolayer. In order to quantify the nature of the fluorescence, a cluster of fibers placed in nanopure deionized water were observed via a Hitachi Fluorometer. When observing the fibers, a characteristic fluorescent pattern emerged. This fluorescence pattern would account for fluorescence seen in the published pictures at the Morgellons research foundation web site. A fluorescent factor (protein) was isolated as described below, and found to have a similar pattern of fluorescence. The cuvette alone did not fluoresce, but an equivalent protein concentration of BSA (bovine serum albumin) gave a fluorescence which differed distinctly from the fiber fluorescence (potentially eliminating bovine albumin as a protein identity). Figure 3 shows the fluorescence observed. 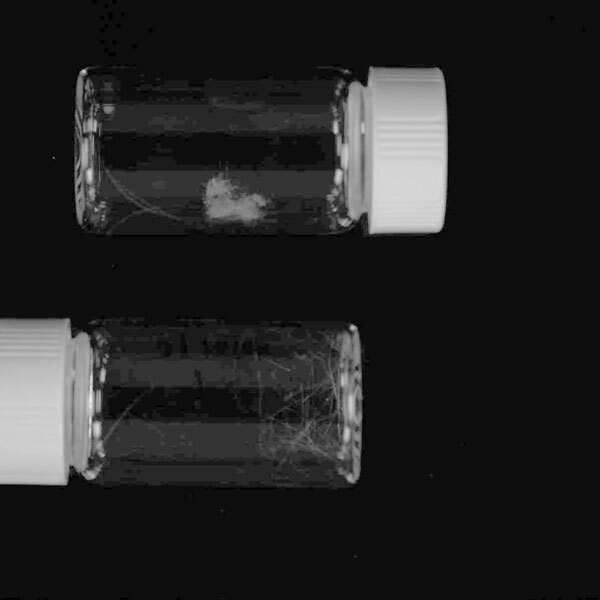 Fibers from a patient with Morgellons Syndrome resisted dissolution in 6 M guandidine HCL, 6 M urea, and Trizol (Sigma) reagent. Fibers were ground in a mortar and pestle and resuspended in 2X SDS Buffer, and run on a 4-20% Tris Glycine Gel. Gel was coomassie stained and destained as described in Mantiatis (1998). 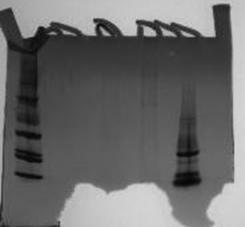 30 kDa, 60 kDa, protein bands were observed. (Figure 4, Lane 5). The predominant band was identified (from gel excision and in gel digest/nanoHPLC/MS at the University of Arizona Proteonomics Laboratory) as human serum albumin and cytoskeletal keratin II (67 kDa) with significant peptide fragment coverage over both protein sequences. Both a UV-Vis spectra of the buffer containing the fluorescent factor and a positive Bradford assay result confirmed that the fluorescent factor contained a protein component. Gel analysis of the fluorescent factor protein component demonstrated a protein with a molecular weight of 30 kDa, also found in the analysis of the entire fiber. Interestingly enough, a similar nano-HPLC/MS analysis of this 30 kDa protein produced no human protein peak comparisons, and only single peptide fragments potentially corresponding to the following proteins (with approximate molecular weights corresponding to 30-40 kDa) were identified (Table 1). It may be noteworthy that the U/Az facility could not purify the protein using conventional methods from the buffer. 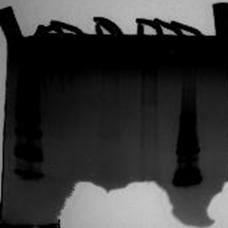 Reportedly, a black tar-like oil precipitated under their assay conditions. This may denote other molecules that were potentially present in the buffer, originating from the fiber protein mixture. The fluorescent factor protein was purified via C18 Sep-Pak chromatography, eluted with methanol/water (50:50) and rotary evaporated to dryness. The resultant powder should be sent to OSU Stillwater�s Proteonomic facility for MALDI-TOF and Edmund sequence analysis. MALDI-TOF will allow the identification of the exact mass of one (or several) proteins in the mixture, whereas Edmund sequence analysis will yield the first fifteen amino acids present in the protein sequence, allowing for either confirmation of the prior nano-HPLC/MS results or bioinformatics searches to obtain the protein identity. As of now, the samples have been sent to Dr. Wymore, due to complications with communicating with the Stillwater facility. 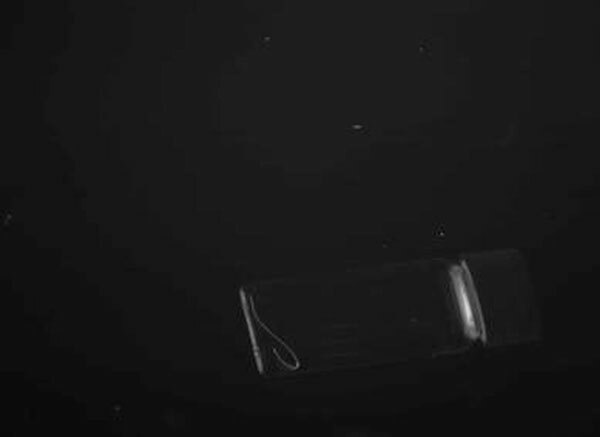 Currently, this protein identity is unknown. The fluorescence (associated with fibers), isolated to a protein composition, may be a unique feature to Morgellons patetients. The establishment of a diagnostic biochemical characteristic to Morgellons would greatly assist clinical practicioners in distinguishing between Morgellons and Delusional Parasitosis. Accordingly, it may be of significant interest to screen a wide variety of fibers from Morgellons patients for fluorescence, in order to establish this as a feature common to many patients. Similarly, it may be of interest to survey textile and cellulose fibers for fluorescence, in order to establish the fluorescent fiber hallmark as a unique, non-commerical, non-man-made entity. Further protein analysis of the fluorescent factor may yield clues to the infectious agent idenitity, as the protein does not, in this single sample, correspond to any potential human gene or protein product. The techniques described here could also be applied to another physical manifestation of Morgellons: the emergence of black �specks� from the skin. A similar protein biochemical analysis of the specks may prove revealing in identifying the entity responsible for Morgellons. Regardless, it must be emphasized that this is the sum result of a single patient with Morgellons, and thus not statistically accurate/valid as a potential portrayal of the Morgellons condition. Multiple analyses need to be conducted on multiple fibers from multiple patients, before this information should be scientifically reported.